Khursheed Nowrojee Jeejeebhoy is Professor Emeritus, Department of Medicine, at the University of Toronto. He is also a Gastroenterologist and Director of Nutrition Support at St. Michael’s Hospital, Toronto. 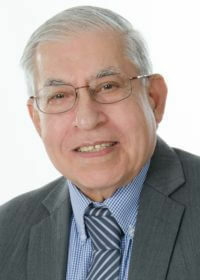 Much of Dr Jeejeebhoy’s work focuses on the assessment of nutritional status, the nutrient requirement in the ‘sick patient,’ and the interaction of disease and nutrition. Dr Jeejeebhoy’s research has been featured in nearly 300 peer-reviewed papers and he has won 21 prizes and awards for his contributions to the field of gastroenterology. With clinical interests in inflammatory bowel disease (IBD), malabsorption, short bowel syndrome and colon cancer, Dr Jeejeebhoy was selected for the Cuthbertson Lecture Award of the European Society for Parenteral and Enteral Nutrition for his studies in energy and protein requirements in sick patients. He also developed and validated the Subjective Global Assessment for Nutritional Assessment, the value of which has since been confirmed by others in surgical patients, renal failure and hepatic transplantation. He is presently conducting a Canadian Institutes for Health Research (CIHR) project examining the effects of nutrients on pro-inflammatory cytokines and apoptosis.